My poor little oven is dying a slow death. It no longer gets above 500f - this bake took 25 minutes - a good bake for long baguettes should be 20 max preferably 18. Result, disappointing pop, but fortunately decent structure on the inside. Dark on the bottom and thicker tougher crust. This mix was rather low and slow on yeast getting about 1.5 volume overnight on cold retard had these puppies been given a bit more kick i am sure they'd be fantastic ... Quelle dommage ! I should also take a snap at then bottom - I notice that in cases like this we are likely to get a darker bottom. It sounds counter-intuitive you'd think a hotter oven would do that but i think it's more a function of the additional time sitting on what amounts to a relatively hot surface - ie 7 additional minutes. So key points, thicker crust, burned bottom lack of spring - prolly not your shaping at fault ! crack me up every time - the last time I posted a failure it was eat half and rest to the birds. The oven was never a real great asset for this stuff - I consider it a bit like learning guitar on a pawn shop beater - sometimes crap equipment pushes you harder right ? 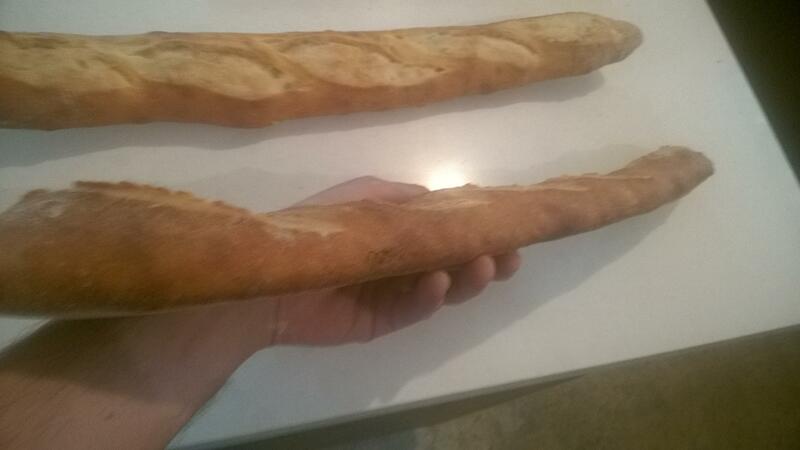 I suppose you could call a perfect baguette oven an investment in your hobby. What does joy mean to you? My husband says having the perfect tool for the job creates joy. I have to agree although I love to try other ways of doing things. Hey mini, you know despite all the science topics on baking (these days gone to stratospheric levels with all the books etc) isn't it really more an art form ? I play guitar and learned on the saddest junker and it only makes switching to a nice instrument all the more pleasurable. I think as home bakers dealing with challenges of domestic equipment only forces you to excel even more - it always amazes me the product being posted here !